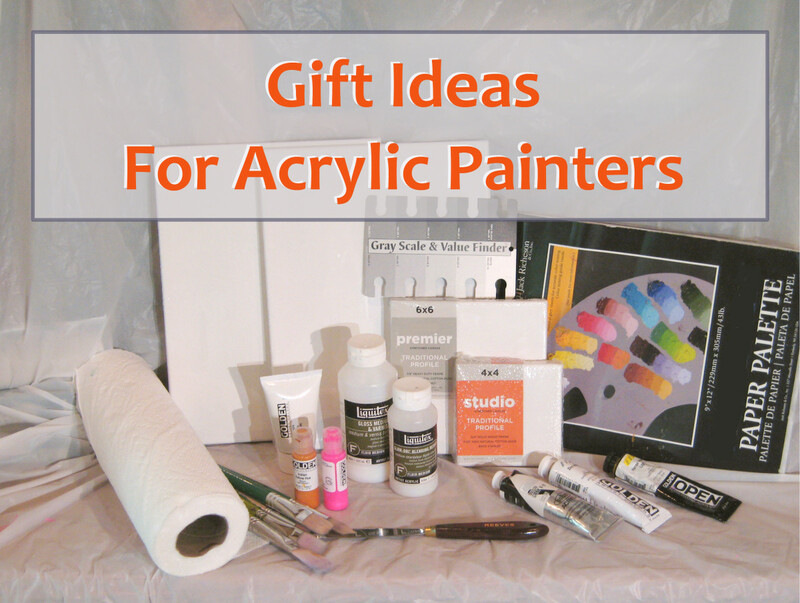 - Keep the bristles moist at all times while painting. - Clean brushes promptly at the end of each painting session. 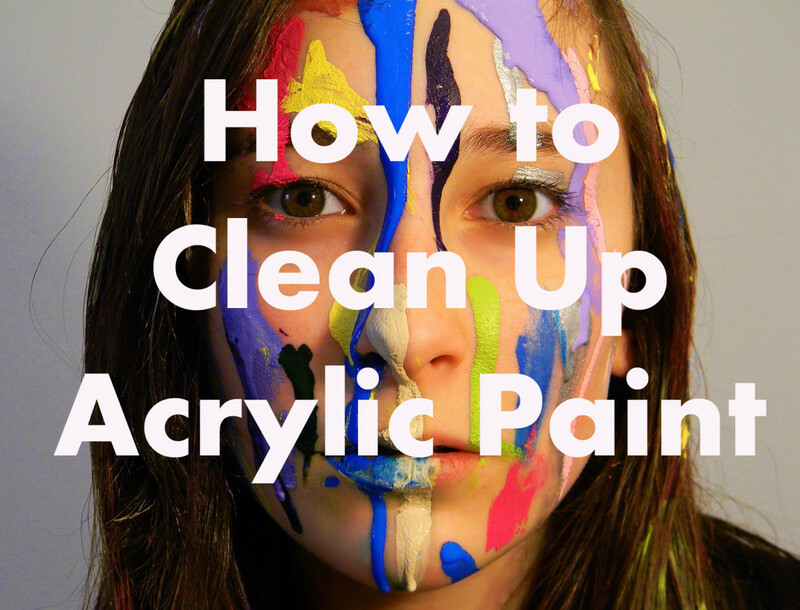 Acrylic paint is easily washable with soap and water while wet, but, once dry, it becomes extremely difficult to remove. If allowed to dry on the bristles, it can definitely ruin paintbrushes. 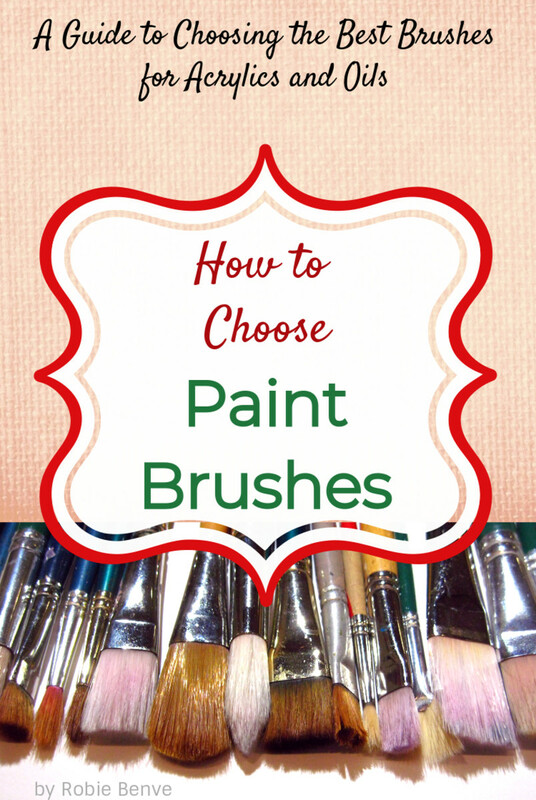 Don't wait for the paint to dry to clean your brushes. Act fast, and focus on preventing any damages. As an artist, brushes are your working tools. You must keep them in good conditions so that they are able to do their job. By cleaning your brushes thoroughly, you extend their life and, in the end, save a lot of money in supplies, by not having to replace them. 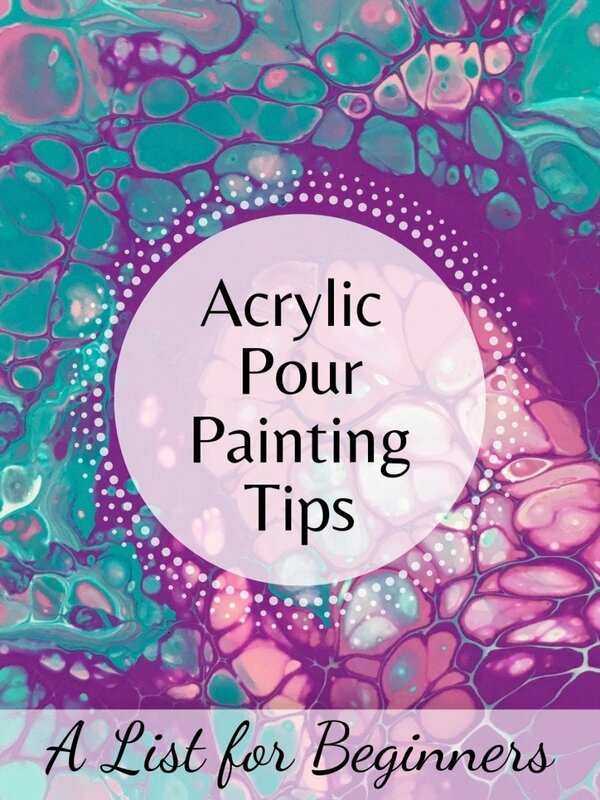 During your acrylic painting session, make sure to rinse any residual paint from your brushes before putting them down and keep them wet just in case there is any unseen residue of paint near the ferrule, you don't want it to dry, or your bristles will spread out and lose their shape. When you change color paint or you switch to another brush, remove any excess paint with a paper towel and rinse the brush thoroughly, then lay the wet brush flat until you need it again. Avoid keeping your brushes soaked in water for a long time, because this could lose or rust the ferrule and damage the handle. For the same reason, wet brushes should be left to dry horizontally, not bristles -up, or the water would drip down under the ferrule. In general, you should never leave a brush standing on its hair for a long time, in water or during storage, because it may bend and lose its shape. 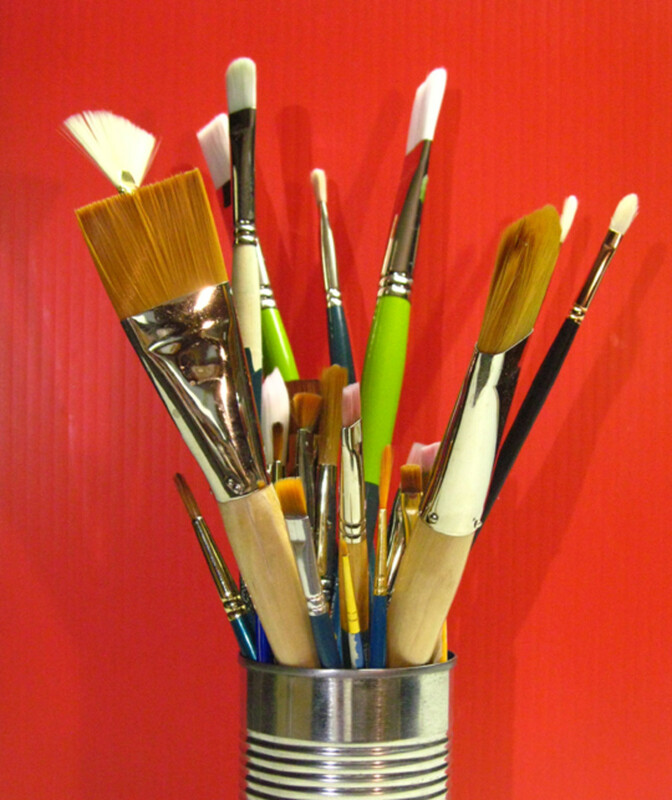 Remove most of the paint from of your brushes using a paper towel or a rag. Load you wet brush with a mild soap. You can use any non-aggressive soap. Many people like to use Murphy’s oil, the household cleaner. I often use hand soap or a laundry soap bar. They also sell specific brush cleaning soaps. Rub the soapy brush on the palm of your hand, in circles. Create enough foam to take off all residues of paint. Massage the bristles with your fingers to get all the paint out from the middle of the hairs. Rinse thoroughly and repeat until foam and water are clear. Dry excess water with a rag, being gentle on the bristles. Flat dry, making sure that hairs are not pushing against any obstacles that may bend them. Once dry, store your brushes flat or bristle-up, to avoid bending of the hairs. Are your brushes clean and neat? No, my brushes are stained with paint and look messy. Yes, my brushes look almost new. My brushes' handles might be stained, but I keep the bristles clean and in good shape. Acrylic paint is not good for the environment, please avoid washing a big amount of paint down the drain. 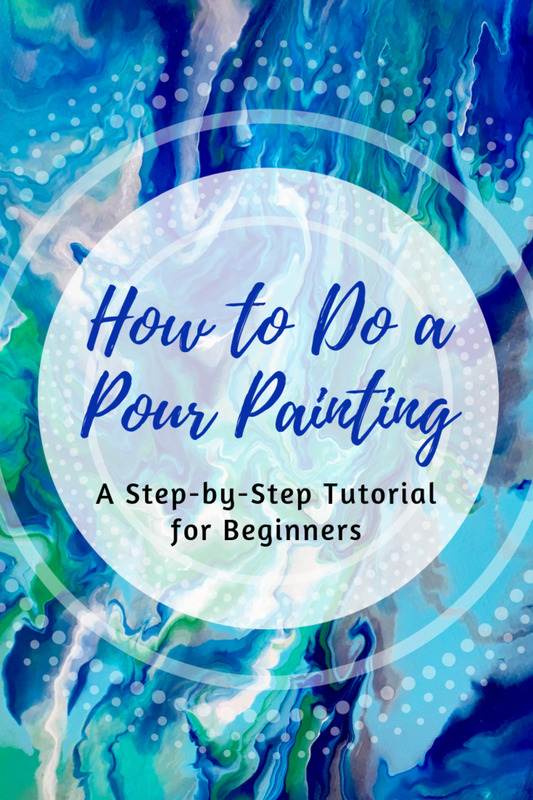 It is much better for the water system if you wipe off excess paint from brushes and your palette with a paper towel and throw it in the trash can. Start cleaning by getting most of the paint off with a paper towel. 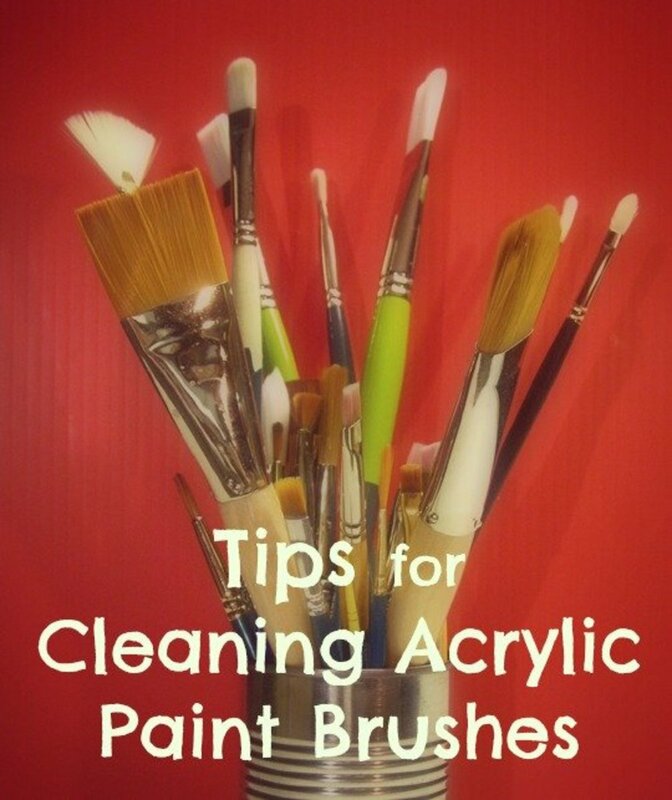 Rub the bristles and the palette with some paper to collect as much paint as you can; then start washing. Use Mild Soap. Avoid dish detergent or other types of aggressive soaps. Use Soap Sparingly. Not to be cheap, but because even the mild soap could dry and affect the brush bristles, plus it takes longer and more water to rinse. Rinse Well. Make sure there is no soap residue whatsoever at the last rinse, or your first paint-stroke with that brush will be "soapy". Absorb Excess Water with a rag, being gentle on the hair of the brush. Lay Wet Brushes Flat. Flat is the best way for a brush to dry. Do not leave the brushes standing on their tip, this may damage the tip and compromise the shape. Ruined your brushes and need to buy new ones? I have this set and it's pretty good! Paint Brushes for Acrylic Watercolor Oil Gouache Paint. Best Art Supplies Painting Brush Set. 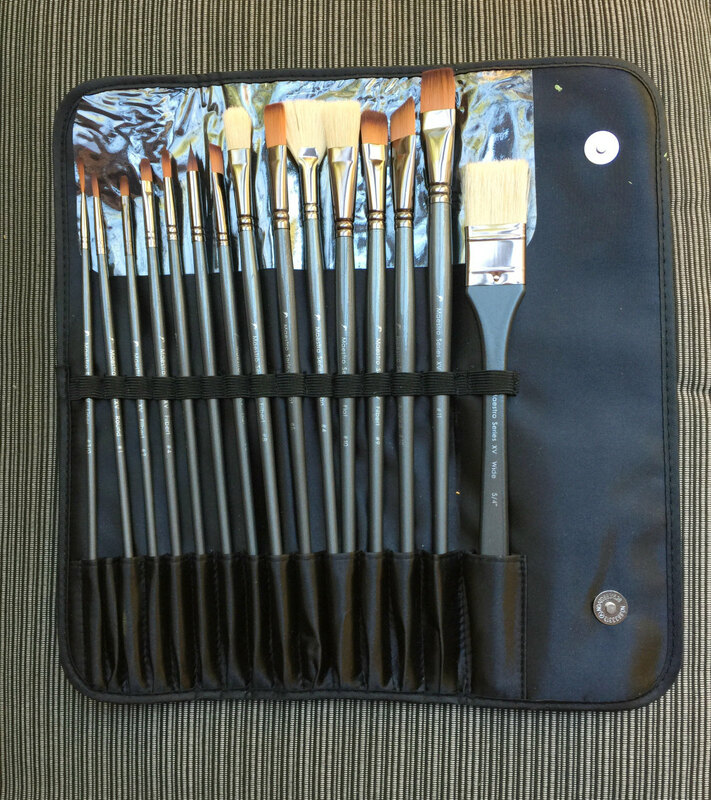 Professional 15pc Paintbrushes for Artists with Carry Case Travel Kit. I'm usually skeptical about brush sets because of their (usually) lower quality, but this one is an excellent combination of affordable price and high quality. 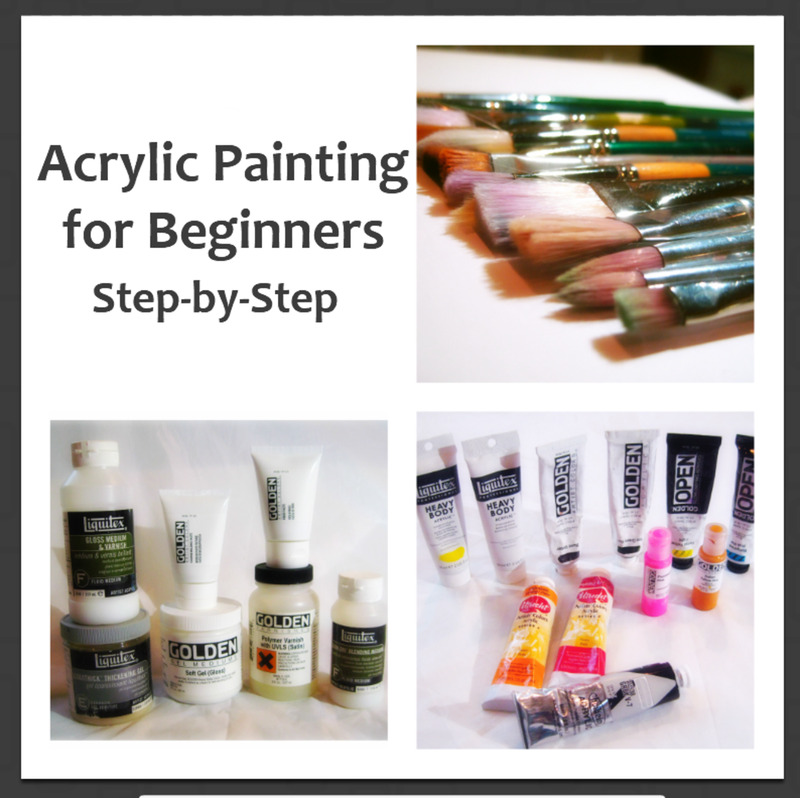 It contains a large variety of sizes and shapes, a great set for beginners until you figure out which brush best suits your style, then you can buy individual ones. Did you not clean your brushes in time? 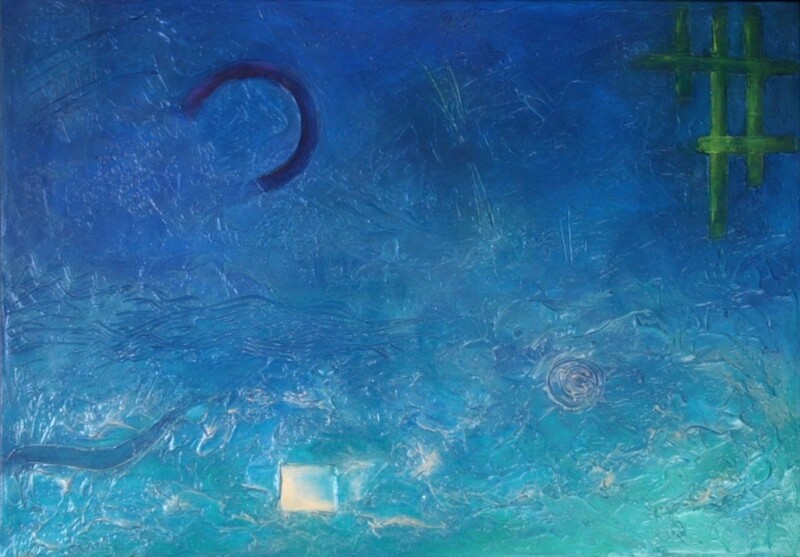 Once acrylic dries, it really does become plastic, very hard to take off porous or textured surfaces. However, there are some emergency solutions that I've heard of, and you might want to try if they work for you. 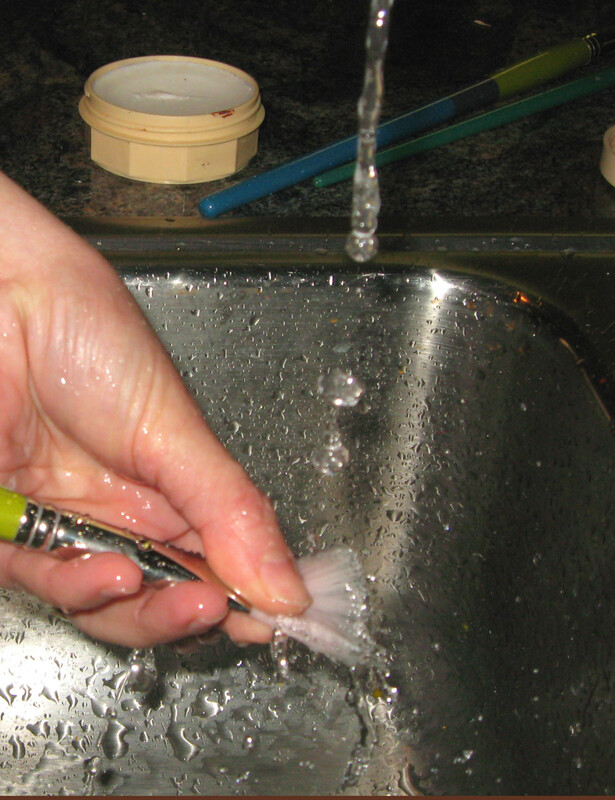 Try soaking the bristles in ammonia, window cleaner, or even rubbing alcohol. These methods will never restore them to be like new, but they might make them workable. You may have success with some of these remedies, but be prepared to buy new brushes. How should I remove old dried paint from the ferrules of brushes? Should I use Turpenoid? If it's acrylic paint that dried on the ferrule, I would try soaking it with window cleaner and then rub it off with your fingernail. For oil paint, I've got good results by soaking brushes with very dry paint in a cleaner by a company called Brush Flush. Everything cleans off like magic. I'm getting frustrated in that other Arthur's are in such an abundance and that im searching for Acrylic stuff and im getting all kinds of crafty things ideas. All I want to be able to read, learn how too is from you Robbie. I'm needing all the Acrylic items together. What do I need to do to obtain this? That's very interesting Josh! I never heard of using rubbing alcohol in the water before, I must try! Thanks for sharing. Happy painting! Another way to make cleaning acrylic paint off of your paint brushes it to mix a little rubbing alcohol into your time water. The rubbing alcohol loosens the binding molecules of the paint and thus makes it easier to rince off and rubbing alcohol can be used to thin your paint if needed. I understand... ruining one too many brushes is what made me do some extra research and learn what I should have done instead. Here I'm sharing what I now know for a fact, in the hope it can be useful to someone else. :) Thanks a lot for stopping by. Happy painting! Hi torrilynn, we gotta keep those brushes clean, don't we? :) Thanks a lot for reading and commenting. Happy painting! Hi Carol, how do you like washable oils? Are they similar to acrylics, but dry slower? Hi europewalker, cleaning up after a nice activity always kind of ruins the fun, doesn't it? I hate those times when I get sidetracked and hours later I realize I haven't cleaned up properly! Thank goodness I always keep mu brushes well rinsed, so I don't get paint globs drying on them, but still! thanks for this really nice hub here. about proper cleaning tips for brushes. A great hub and saving these brushes which do add to the expense of painting. I have now added washable oils to my media..But my acrylics are here when I get in the mood. Thanks for a great hub..Voting up+++ and pinning. Helpful hub. I like to paint but I hate to clean my paint brushes! They are a mess. Voted up and useful.